England maintained their lethal form as they hammered Montenegro 5-1 in Euro qualifiers. 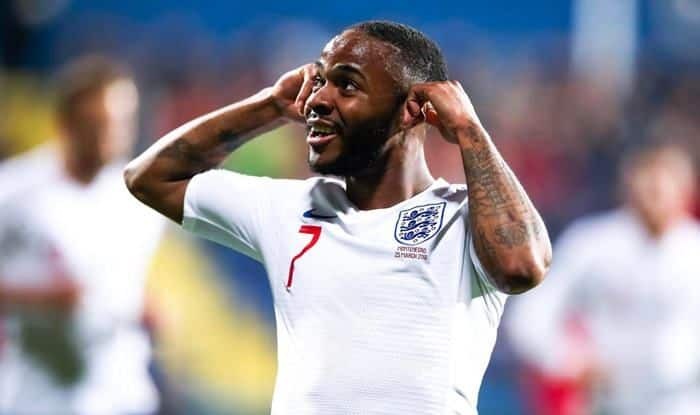 Manchester City forward Raheem Sterling was once again the star performer as England registered a comeback from conceding an early goal to beat Montenegro 5-1 and maintain their excellent recent form. The Group A favorites, in a projection of their lethal attacking font, have scored five goals in their second successive match. The Gareth Southgate-coached side also scored five goals against the Czech Republic on Friday, winning the match 5-0. Jordan Henderson, Jadon Sancho and Ben Chilwell were dropped to the bench and Declan Rice, Callum Hudson-Odoi – England’s second youngest starter in a competitive match, behind Wayne Rooney – and Danny Rose were brought in on Monday night. Eric Dier, who was ruled out of the qualifier against Montenegro due to an injury picked up against the Czech Republic, was replaced by Ross Barkley. The Chelsea man scored twice to cap an impressive midfield performance, with Michael Keane, Harry Kane and Raheem Sterling also getting on the scoresheet. Montenegro took the lead thanks to an excellent run and finish from Marko Vesovic, who curled a shot past the helpless Jordan Pickford. Keane, who was at fault for that opening goal, got England’s equalizer when he found space at the far post and powered in a header from Ross Barkley’s deep cross. England were soon in front when Barkley deflected Callum Hudson-Odoi’s shot on 38 minutes to ensure that the visitors went into the changing rooms at half time with the lead. Barkley scored his second and England’s third goal in the 60th minute after a cut back from Sterling left him in plenty of space to drive the ball into the net. The City forward was again the provider for England’s fourth goal when he set up Harry Kane for a tap-in. Sterling then rounded off the scoring with less than 10 minutes left when he was played in by Jordan Henderson.